upcoming live-action tvN drama series “The Liar and His Lover” starring Lee Hyun-Woo & Joy. Drama series is based on manga “Kanojo wa Uso o Aishisugiteru” by Kotomi Aoki. In the ep.1 teaser trailer, Joy as Yoon So-Rim sings a heartfelt rendition of song “Now I Wish It Would Be Like That” by Cho Yong-Pil. Lee Hyun-Woo as Kang Han-Kyeol asks her “you sure you practice? Let’s do it again …” but he clearly looks impressed. Based on manga "Kanojo wa Uso o Aishisugiteru" by Kotomi Aoki (first published May, 2009 by Cheese! magazine). First script reading took place January 21, 2017 and second second script reading, featuring the main cast, took place February 8, 2017 at CJ E&M Center in Sangam-dong, Seoul, South Korea. 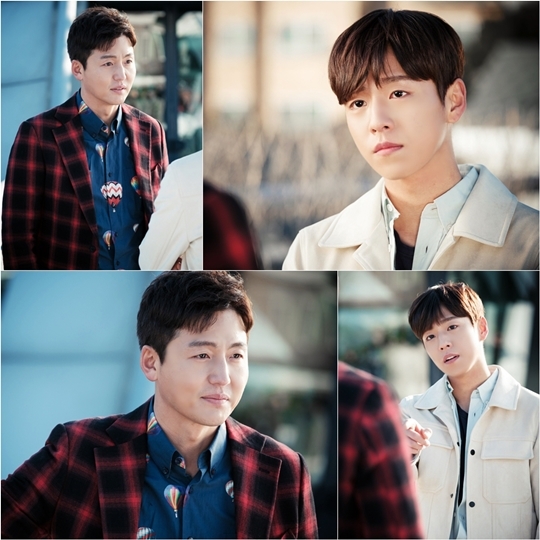 Still images of Kang Han-Kyeol (Lee Hyun-Woo) and Yoon So-Rim (Joy) meeting for first time. “The Liar and His Lover” first airs March 20, 2017 in South Korea.